With the rich bounty of the season surrounding them, people are constantly reminded of the gracious plenty of the holidays. But what of wildlife-will their Christmas and New Year’s be merry? Cold weather, and its deadly effect on insects, is the main reason many birds leave the state and go south to find an area where insects are more active, according to Glover. Birds staying in South Carolina year-round are mostly seed and berry eaters, like cardinals, titmice, chickadees and mockingbirds, or predatory birds that feed on rodents, birds and other small animals. 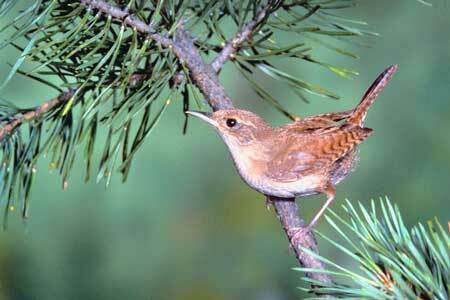 Carolina wrens and a few other species, which feed primarily on insects but remain here in winter, are the exception. 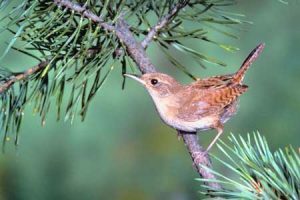 “Somehow Carolina wrens find enough insects to survive during the cold months,” Glover said. “Wrens really have to work at it when the temperature drops below freezing, but they search bark and crevices and look under dead leaves and in spider webs trying to pick up bugs.” Some foods that people can put out to help wrens through a hard winter include mealworms, crushed nuts, hanging suet and peanut butter. Not all types of wildlife are scrounging for a living during the winter-some are busy with a blessed event of their own. Great horned owls mate around Christmas time in South Carolina, and December through January represents one of the two major breeding periods for gray squirrels. Bald eagles also nest in December. Glover finds it appropriate that many South Carolina residents remember wildlife in their thoughts and deeds during the holiday season. Pinecone ornaments packed with peanut butter and seeds are tempting treats, and strings of fruit made with apples, raisins, figs or cranberries make tasty decorations. Suet or beef fat is also a good choice for winter birds. While feeding birds and other types of wildlife is ingrained in the consciousness of many South Carolina residents, other important considerations for animals are often overlooked. During cold snaps, or when snow and ice are on the ground, adequate cover for wildlife can be the difference between survival or death from exposure. “During winter the best cover is provided by evergreens,” said Glover. “Most people have evergreen azaleas or camellias in their yard, but that’s not really prime wildlife habitat. For birds, you need a plant that gets up there in the 10- to 20-foot range, like hollies, cedars, wax myrtles and cherry laurel.” Many berry-producing evergreens such as hollies and cedars serve as a sort of combination shelter-supermarket, providing cover and a much-needed source of food. Animals also need a dependable source of water, especially when the mercury dips below freezing and shallow drinking spots freeze. “Birds are in some cases more attracted to water than they are to food,” Glover said. Bird bath heaters prevent water from freezing, and recirculating water systems keep water moving. For more information on South Carolina wildlife, visit the DNR website at http://www.dnr.sc.gov/wildlife.html or call (803) 734-3886.